These three working hard at the computer were made by Kat Rocha and are now off to Germany. I made a peep today but I can’t send a picture as I only have a scanner and the darn thing is so 3-dimensionally cute. 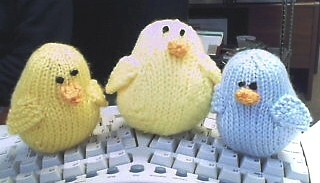 Questions: 1) Which side of the peep is the front, the straight 6 stitches side or the pear shaped side? 2) which side of the wings is the front, the edge of the rows or the bind-off? These are just the cutest things I think I am going to have to make some!! thx so much, i adore it!